Ergonomically designed silicone coated keyboard with 88 keys and 12 function keys. Our KeySonic keyboard has an excellent tactile feedback and is waterproof to IP68 norm and can therefore even be immersed in liquids. The surface of the KeySonic keyboard is equipped with a special coating and therefore has a good mechanical and chemical resistance so that you can work with standard disinfectants and the keys print will not fade. KeySonic Industry keyboards are antimicrobic and fungistatic and prevent the growth of fungi, mold and spores. Therefore this keyboard promotes sterility. 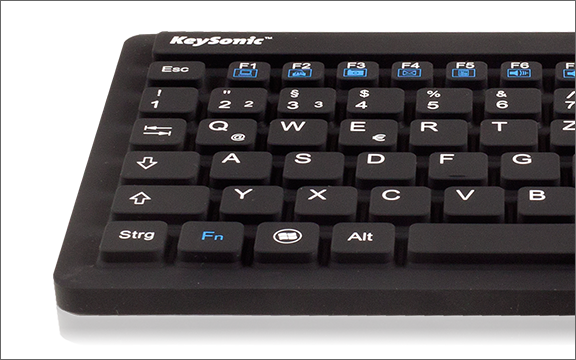 KeySonic Industry keyboards comply with the RoHS norm / medical section and they are made of non-acidic and safe materials. 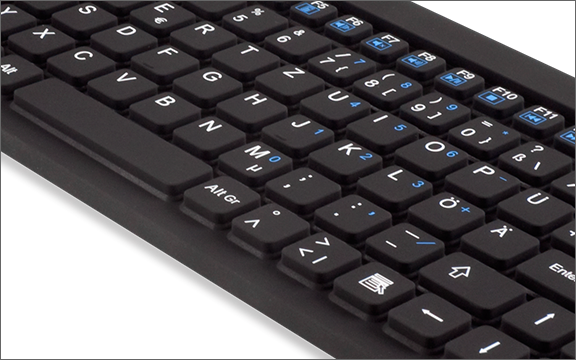 KeySonic Industry keyboards are 100 % waterproof and comply with the NEMA 4X and IP68 norm. Sérhannað lyklaborð sem hentar m.a. í sjávarútvegi, framleiðslu og/eða sambærilegum iðnaði. 100% vatns- og rykhelt skv IP68 stöðlum og má jafnvel fara í uppþvottavél. Þetta lyklaborð er fyrirferðalítið og passar því nánast hvar sem er. Vantar þig mikið magn? Hafðu samband og við gefum þér tilboð.